Client’s account management and configuration can be done here. 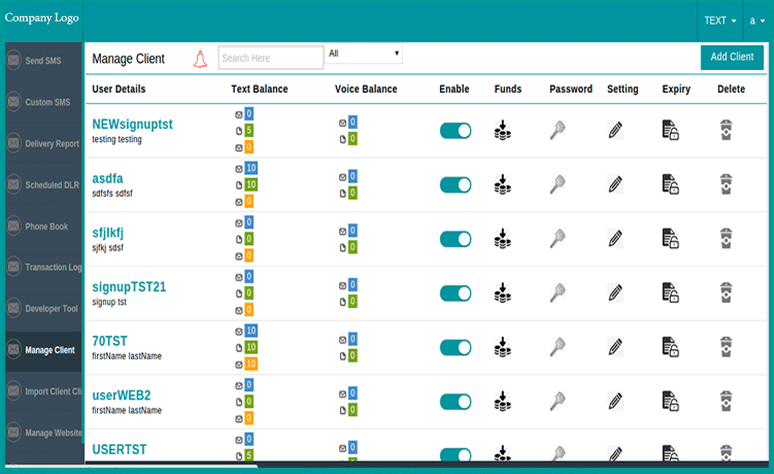 Get a complete view of clients activity Including “track sms” status,”add fund”, “managing routes”,” account configurations”,“edit profile”, “enable” and “disable” the client’s account . Through single click on same window you can manage your all client’s activities. The Fastest way to get your Sms delivered.Be your own leader and make your own story.Better panel for better business and serve better. A reliable, scalable and fully secured sms software which uses latest technology to upgrade. With by The Basic © 2015. All Rights Reserved.